A real estate transaction is like an orchestra, if the many components are all in harmony the real estate transaction just like the music in an orchestra is beautiful. And just like an orchestra no one person can play all the instruments, and that’s why we have assembled the best orchestra in real estate. As one of the largest financial transactions a family will make in their lifetime it is critical the “orchestra” required to get the right results for the sale of purchase of a home be in harmony. From marketing, neighborhood knowledge, negotiations, escrow, and protecting clients from legal exposure no one agent is capable of playing all the instruments. Because of the vast complexity and demands of the modern real estate transaction we set out to create the team approach to serving the real estate seller and buyer. And over the years, we have assembled an orchestra of specialists who put the plus in everything they do. From marketing experts, legal experts, and local agents all in harmony as part of the Boyenga Team our clients receive a level of service and detail unparalleled in real estate. You cannot find another team with our depth of experience and knowledge and support, and we are proud of having assembled the best team serving the Monterey Peninsula through Silicon Valley. 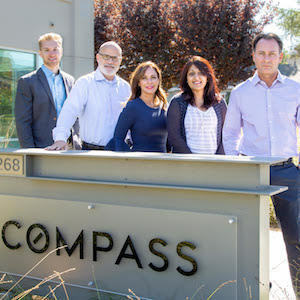 In partnering with Compass, we are able to offer clients unparalleled support along with the latest in cutting-edge technology. Their strong business ethics and strategic thinking – coupled with the group’s of over 150 years of combined real estate experience – create a unique residential sales team. Our clients appreciate our enthusiasm, integrity and personal approach. Real estate, is like life, is all about getting the details right, that means understanding the client’s needs and hopes, that the client knows their choices, and that we work together efficiently to achieve the transaction they expect when choosing their real estate team. There are many people involved along the way – family, other agents, legal advisors, escrow officers, lenders – and a major part of my job is to orchestrate the events which lead to a smooth sale and closing. But most importantly every client is treated like family, and we take pride in the long term relationships we have developed with our clients over the years. From working to define a client’s vision and managing those expectations, to negotiating with tenacity while keeping in close communication, the Boyenga Team is well-known for their tireless determination that ensures her clients meet their goals, regardless of how complex. Over the years our team has been coined as the “Property Nerds” because of our love and passion for residential real estate. With local expertise, unparalleled marketing, and personal service we would like to show you the Boyenga difference. We are proud to serve luxury buyers and sellers in Carmel by the Sea, Pebble Beach, Big Sur and beyond. The Boyenga Team has been recognized nationally by many publications, including Real Trends and the Wall Street Journal as one of the top 150 teams in the entire country.